This is an announcement about the tea of the month series for 2015 as well as an outline of January’s upcoming tea of the month. Similar to the other tea of the months this will be more of a personal blogging style post. The mature pu’erh report will come out independently in two weeks. I launched the first tea of the month in March 2014 and have since done eight different reports. Overall, it’s a fairly free-form format which I’ve personally enjoyed a good deal. 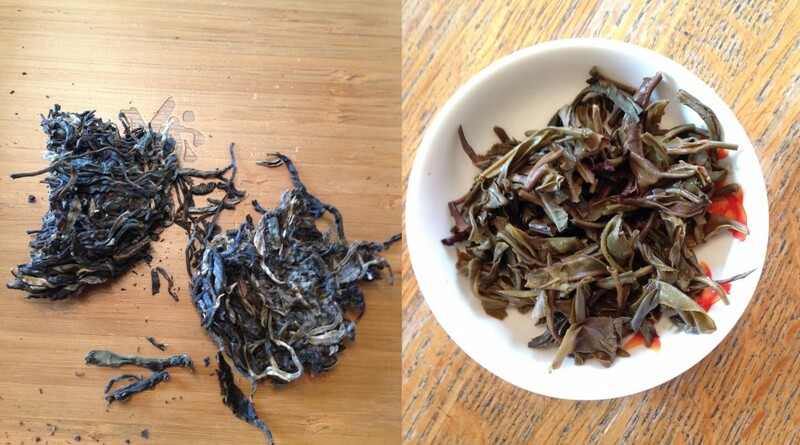 It gives a far less filtered look at certain teas and more comparative impressions. As many have stated, the TeaDB video reviews end up being a biased selection of teas that are usually hand-picked for review. While we (especially Denny) will do blind tastings of teas on occasion, they’re often picked out for some reason or another. Big thanks to our readers and for suggestions, this is a great time to post them in the comments! That being said, 2015 gives me the opportunity to tweak some things and mess with the format a bit. Unfortunately for those that want me to tackle other tea genres (i.e. Chinese greens, Dancong, etc. ), this is inevitably going to be tied in deeply with my own interests as a tea drinker, meaning they will probably always be focused on primarily pu’erh with some aged/darker oolongs. In 2015 it will follow a 3 months on, 1 month off format. Problem: There are too many teas for me to drink through. I firmly believe that teas (especially pu’erh) can have dramatically different sessions. I think to better understand a particular tea, multiple sessions are usually required. Under my ratios 25 grams can provide for 4+ sessions, but I seldom get to drink through the full samples in just the month. Given a standard month length, I get through about 40 sessions of that particular tea type a month. Some of the reports had me drinking through 20-30 teas. That is simply too many because it doesn’t allow me enough repetitions with the tea. It can also be monotonous for teas that aren’t quite as exciting to me (ripe pu’erh). Solution: I’m going to be dramatically reducing the total amount of core teas, to 10 teas. This will change how I drink, as I’ll attempt to really dive hard into these 10 and get multiple repetitions with them. I’ll also have a reserve list of teas to go through that I’ll try to drink at least once. Problem: Some of the tea of the months (especially ripe pu’erh/Japanese greens) were done under the dual purpose of learning as well as getting through my stash of older purchases that I don’t touch much. The end result: a haphazard report with a pretty random selection of teas. Solution: I’ll be announcing the core teas ahead of time with the specific purpose of opening it up for opinions and suggestions. Unfortunately, like many drinkers I am limited by budget. While, I’ll do what I deem is reasonable to acquire samples of some of these teas. I don’t really like asking for handouts but we’ve had people send in teas in the past. I’m not really going to expect teas being sent our direction, but also won’t be refusing anybody that want to send in teas. This will also serve the dual purpose of allowing those who want to drink alongside to do so with more accuracy. It is often difficult for those in the west to drink with others, let alone those as enthusiastic as themselves. The internet isn’t necessarily a total surrogate, but conversing and sharing opinions is important to people’s growth as a tea drinker. You may also note that many of the topics were covered in 2014. This is intentional. Hopefully for all repeats, they will continue to build off all that I learned during 2013 and 2014. Thanks to all who recommended interesting teas and helping me to stretch myself as a tea drinker. One potential idea I’m considering is shortening the length of some of the less interesting ones or things that are more appropriate with 1-2 week lengths (i.e. Menghai ripe recipes or something). I really haven’t drank much in the way of Lincang teas. One thing I’m particularly concerned about this month is overdrinking young pu’erh and messing up my stomach. This entry was posted in Aged Oolong, Aged Pu'erh, Anxi Oolong, Article, High-Mountain Oolong, Low-Elevation Oolong, Oolong, Raw Pu'erh, Ripe Pu'erh, Taiwanese Oolong, Wuyi Oolong. Bookmark the permalink. 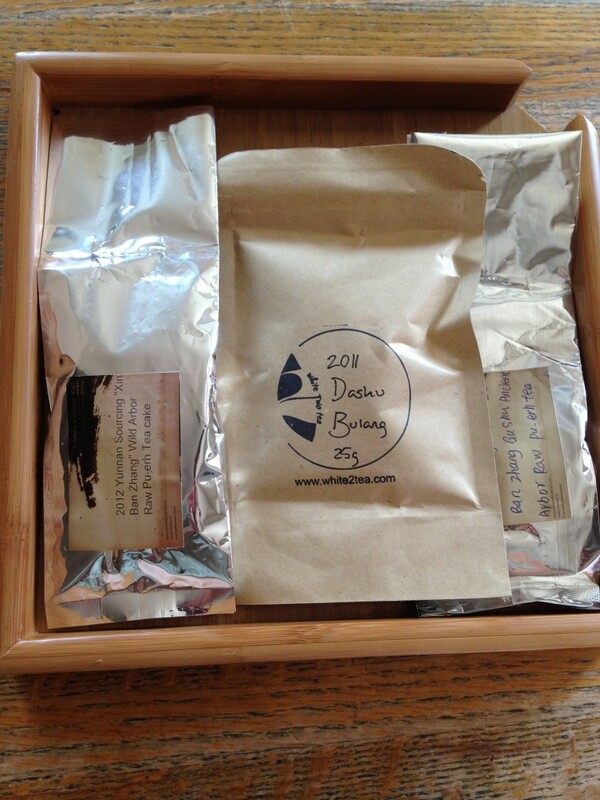 I have your tea box ready for you. You can send me your address at hster dot investigates at gmail. -Silver tip beengs- can they really age? -Random cheap aged tea from unknown eBay vendors – Is it really all crap or is the price low enough to bother with? You should make this a pot luck. -Aged Shus- Is the aged premium worth it? Thanks for the comment and the generous offer. Some great suggestions there. Alot of these seem like they would justify mini-units, so I’ll be keeping those in mind as I move forward. I can’t say I’ve ever heard of purple lady tea!? Ebay aged tea is almost 100% likely to be bad. You’re not going to find many bargains for aged tea online, mid-aged tea is possible though. As for shou with/without age, the stuff with age tasted a bit fuller to me, but I have very limited experience with that. The next two items, you’ll need to ask for sample sizes. I know you can get 10g size of the latter. If you’re set on that TU, you have a Bangdong tea, and could try a young Fengqing like:http://yunnansourcing.com/en/2013-yunnan-sourcing-teas/2485-2013-yunnan-sourcing-da-si-ancient-arbor-raw-pu-erh-tea-of-feng-qing.html . If you’re not set on that TU Nahan, http://www.white2tea.com/tea-shop/2014-54-46-old-arbor/ is from the same area, I believe. Have you had the 2001 High Mountain? I would think you’d be bored out of your mind. Emmett on the Cha & Kung Fu blog was selling off a mostly whole cake for $70 end of last year- he might still have it. I probably can part with the sample I have left over but IMHO don’t think it’s even worth consideration for the Lincang teas. However it might be worth consideration for aged purples category just to confirm the prevailing prejudice. Sure, I’d be quite interested in trying it. I was looking pretty hard at that when Emmett was selling it, and yes, part of that was about how I was interested in how a purple tea ages. And I imagine James would still be interested in that–there are many, many purple Lincangs, and remember, I have that XZH Dinjin Nu’er which looks to be a sort of purple tip tea. Thing is, all wild leaf tea is pretty monotone. I am traveling soon so I will have to send it after I return. 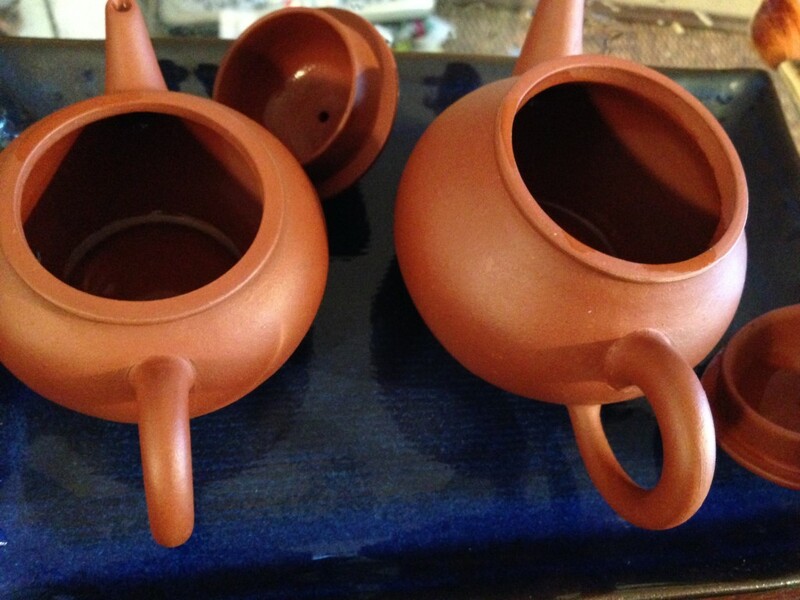 I’ll also have the 2004 Changtai teapot ancient tree by then as well. Thanks for the insight and recommendations. I will see how many of these I can fulfill. ps. Thanks for tipping me off re: 54-46. I now have a sample incoming, so it should make an easy addition. Lincangs tend to have a strong need for airing out, and I suspect the older the tea, the more it needs the airing process. I think that it is a good idea to stick with your “core competencies”, James. The info that you provide will, as a result, be much more worthwhile than if you were reviewing genres of which you are unfamiliar. But your statement ” Unfortunately, like many drinkers I am limited by budget.” is erroneous, as you have access to the company credit card! Thanks for the comment. Aha, unfortunately Denny and I no longer have access to that card. Abuse of power I’m afraid :). Thanks for the comment. A good reminder and some very good points re:water. You’re definitely correct that it does have a large impact on the tea. I’m still not certain I am ready to spring forward to much in the bottled water department. The water is usually considered to be excellent up here in the Pacific Northwest which is also likely affecting my decision. I’ll definitely be doing some tests to see the ~ppm though. Perhaps I am being short-sighted or lazy, but I hope you understand. Thanks for the comment and sharing your ntoes. I did some water tests a while back. All I could conclude was that they tasted different, but didn’t really have a personal preference. This topics keeps getting brought up. I really should do some more in-depth studies on the water I’m using. Great ideas for themes. I like the Lincang and Simao shout outs right off the bat, I’m all about the wuliangs I’ve had the pleasure of trying! Also +1 on the quality of NW water, I am a water snob and have no problem with drinking Portland tap water. I used to go crazy when I lived in the Midwest with how hard and chlorinated the water was for tea, it really tarnishes the experience. While we all can’t have awesome tap water (and it changes over the course of the year) I think it’s super important to just try your water w/o tea and to experiment, and to keep in mind that your cold water might taste way different than what’s in your kettle after the 5th time you bring it to a boil. It pays to nerd out! Thanks for the comment. I’m looking forward to exploring these regions. Glad you’ve had good experiences with PNW water too. Thanks for the comment and suggestion. Heicha is definitely on my radar. I probably won’t get to it for the first part of next year, but hopefully I can devote a couple months to it at some point.